Justine Thornton QC has been made a High Court judge, it was announced yesterday. 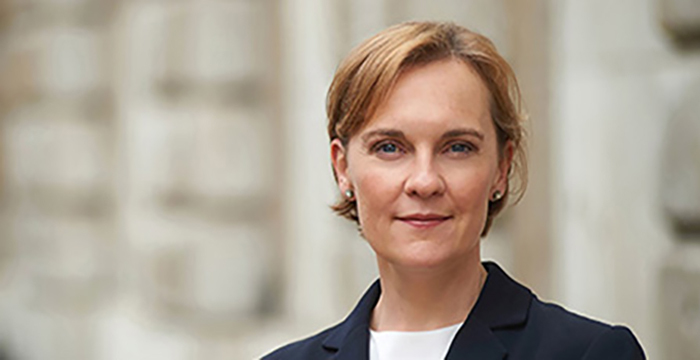 Currently based at London’s 39 Essex Chambers, Thornton will take up her latest judicial role next month. Taking to Twitter, the planning, environment and property law barrister said it was “a huge honour and privilege” to be appointed to the Queen’s Bench Division. The Cambridge-educated barrister’s stellar CV includes stints Allen & Overy, Simmons and Simmons and the European Commission. She was called to the bar in 1994 and took silk in 2016. As an interesting aside, 48-year-old Thornton is married to Ed Miliband, the former Labour leader and MP for Doncaster North. Miliband, who married Thornton in 2011, said he was “very proud” of his wife’s achievement. This, however, isn’t Thornton’s first taste of life on the bench, having been appointed a deputy High Court judge in 2017. If a man had been made High Court judge I doubt reports would have mentioned his wife’s reaction…. Of course not, that would hardly be headline-worthy. Man is becoming a high court judge. Woman is Maria Sharapova. Would it make headlines? Probably. Would I engage in sexual conduct with Maria Sharapova? Yes. Would I vote Labour? Possibly. Where does that leave us? I’ll let you decide. What if it was a more open arrangement? Let’s say, a very open relationship between Jennifer Aniston, Will Ferrell, Joanna Lumley and a recently appointed female high court judge. Would the high court judge’s appointment get much press time? Unlikely. Would it make a difference if it was a man? Probably not. If we take Will Ferrell out of the equation, would that change things? Possibly. How did Joanna Lumley wriggle into this arrangement? No idea. If the former leader of the opposition’s husband was made a HC Judge, the papers would without a shadow of a doubt ask the female former leader of the opposition her reaction. Ludicrous to say otherwise. If Theresa May’s husband had been appointed High Court judge, would May’s reaction be reported? Incorrect. The aside was not interesting. She may be a superstar silk with a glittering past and a formidable future, but she isn’t head of the Thunderbirds. To this extent, she will always live in her husband’s shadow. I look forward to serving the public by upholding justice on behalf of every citizen. She certainly has got the hang of how to speak Labour. I would be surprised if every citizen gets to benefit from her justice, because Cherie Blair ‘s tenure as a High Court judge was barely a ripple,in that regard. Wonderful that Ed Miliband is outshone by not only his brother, but also his wife. Quite why the incapable man ever thought it a good idea to stick his head above the parapet and run for Labour leader is anyone’s guess. We are talking about a man who forgot to put himself on his children’s’ birth certificates for heaven’s sake. Imagine – if he hadn’t run for leader in 2010 brother David would have won. David would have gone on to win a majority in the 2015 General Election. As a result we would never have had a referendum on leaving the EU. Austerity would have ended in 2015. We’d all be happier and not at each others’ throats constantly. There’s no guarantee DM would have won the 2015 GE. He was far more of a Blairite than his brother and that’s why Ed got the nod. It was the right choice then and it would be the right choice again. The Daily Fascist and all the other rags would have found a way to do him down in any case. Maybe not over eating a sandwich but they’d have made up some bs. Poor bloke must feel pretty inadequate, when his political career ended in very spectacular failure, following seeing off his highly able brother. Certainly made his contribution to history via his losing, as had he left his brother to lead Labour & win the subsequent general election, there would have been no EU referendum. And now his wife hits the pinnacle of her career. Poor Ed, I feel a bit sorry for him being such a loser. And Cameron’s such a winner isn’t he – in his overpriced shepherd’s hut with chronic writer’s block despised by most of the country and getting so fat he’s looking more like the pig he fucked by the day. Ed is not a loser if he was being steered. See if he gets a lucrative deal, as often happens. She was not a success as a Silk – hence she gave up after 3 years – but let’s hope she does better as a judge. Personally, I would like to learn more about Ed Miliband’s reaction…. Did he celebrate with a bacon sandwich?? Disappointed Alex deleted my comments on the family law judgment article. Why on earth?